Paul Graham, Y-not look at APOC? I was lucky to arrive at Twiistup 2010 for my volunteer shift during a lull in the action behind the check-in table. Feeling rather foolish in a black business suit and lace blouse, I sheepishly took a seat in the Skirball auditorium in the middle of a talk by Lisa Cole (BlogHer) and Bambi Francisco (Vator.tv) about challenges facing women entrepeneurs. Francisco regretfully commented that women are at disadvantage because so much real work gets done outside of the office after 5 p.m. when we women are “home barefoot in the kitchen tending to our children and husbands.” (my interpretation, not her words.) Oh, really? That got the ire of several women sitting near me. Cole quickly pointed out that women all have different circumstances and that she and her partner took turns tending children in the evenings. Whatever else the women discussed was just lost on me after that. So, I hid out in the auditorium for a few more speakers and was thrilled to hear Paul Graham (Y Combinator) interviewed by Om Malik (Giga Omni Media) on the topic, “Starting Up Fast and Cheap.” As my fellow volunteers Christopher Bazin and Josh Cox hoisted bulky leather chairs to the stage, I slithered down in my seat hoping they wouldn’t notice I was partaking in the conference instead of working. Whew! They didn’t even see me. 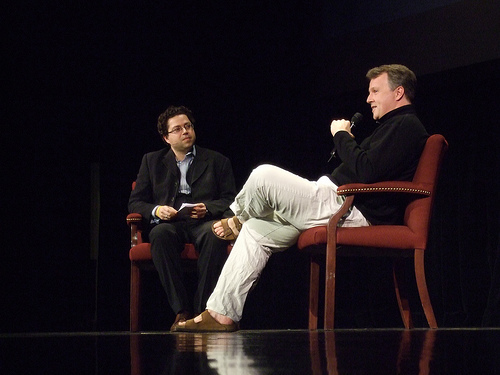 Graham in his Birks at a similar conference last year. So, Graham walks on to the stage in a pair of old brown pants, a slouchy leather jacket and Birkenstocks, sits down, and slings his right arm over the chair in a “I’m too cool for words” gesture. My instructor, Clint Schaff, later remarked that the sign of a truly successful entrepeneur was when they shed the jeans/sport coat uniform and totally dressed down. Graham fit that bill, for sure. Om: So Paul, what advice would you give to young people who want to start their own business? Paul: Ah, well, gosh, ya know. It’s just that everyone out there today wants to start a social network . . . as if you can just go over into that corner over there and say, here’s a portal for dogs and then you get all the people who like dogs to go stand in that corner and then you try to charge people for standing in that corner. It just doesn’t work that way. Om: So Paul, I mean what would you do then? What do you tell people to build? Paul: Build something you NEED. (Graham went on to emphasize that small ideas can be big features. Just think, he said, about how someone with the idea that there should be a programming language for the Altair computer eventually became Microsoft). Om: So Paul, I mean, what advice would you give to someone who comes to you for funding? Paul: Well, frankly Om, startups should be thinking about cofounders. It’s the one thing you can’t change. Om: Ah, where do you find a good cofounder and what are the qualities to look for? Go after the venture capital BEFORE you think you need it. The three most important take aways are 1) Cofounders, 2) Be smart and 3) Be determined. And you won’t make it at all unless you have #3. Hey, Paul. Over here in this corner! APOC students galore. Connected, intelligent and gritty as hell.